salt and pepper shrimp or fish or chicken! Classic American Chinese-restaurant food. Who knew it was so easy and fast?! No more than 30 minutes. I tweaked a few recipes and my daughter and husband have declared this version to be Feeding My Ohana-worthy and fit for company. Even I sneak a few in, despite my shellfish allergy. At some point, I'll also try it with chicken so as to avoid the allergic reaction if I eat one too many. I prefer a flat non-stick pan instead of a wok because the shrimp lie flat. Shell and vein the shrimp, but leave the tails on. 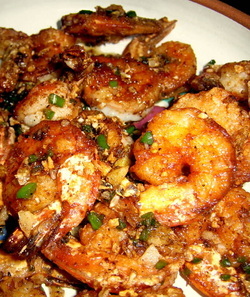 Mix everything except cornstarch, shrimp and salt and pepper into a small bowl. Heat up a non-stick pan and just enough oil for a thin sheet of hot oil the bottom. Dredge shrimp in cornstarch. When the oil is hot (cascading sheet action and moves easily around the pan), put the shrimp in a single layer. It will sizzle. Sprinkle salt and pepper over the shrimp. Turn it over just once, until it is just cooked, likely 1-2 minute on each side. Take shrimp out and drain on paper towels. If necessary, add a bit more oil then toss all the spices and give it a quick stir. The spices will sizzle. Immediately toss the shrimp back in and mix just until the shrimp is coated with the spices and everything is heated through. Tastes best with hot rice. 2) The same Ohana-er has used swai with a mochiko coating instead of cornstarch, tossing the spices into with the fish with good results.